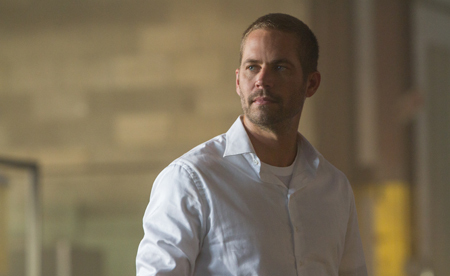 Fans of the film series will love the impossible stunts and tear up at a touching tribute to the late actor Paul Walker. Check out Kidzworld’s review of Fast and Furious 7. 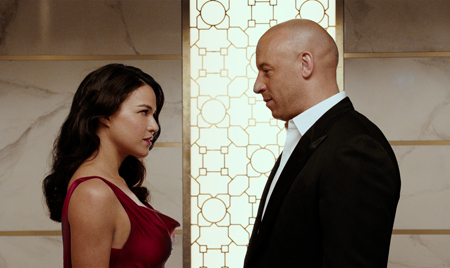 As Dom Toretto (Vin Diesel) always says, “This is about family” and, this time, it really is. The gang is attacked by a baddie’s relative from the last film and he means business. It’s going to take some amazing action and a high tech device to bring him down, all while Dom and pals bond like never before. After the action in Fast & Furious 6, Dominic Toretto (Vin Diesel), Brian O'Conner (Paul Walker) and the close-knit gang are back in the U.S. living “normal” lives. Dom’s girlfriend Letty (Michelle Rodriguez) is still trying to recover her memory and Brian’s most exciting day in a car consists of driving his tiny son, with wife Mia (Jordana Brewster), to school. Things perk up when Deckard Shaw (Jason Statham) the bro of near-dead, hospitalized F&F 6 baddie Owen Shaw (Luke Evans) is after the gang for revenge. 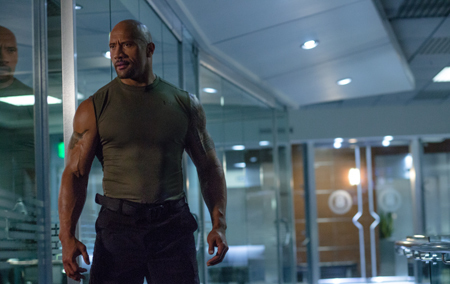 He kills one of Dom’s crew and roughs up (believe it or not) government operative Hobbs (Dwayne Johnson). Dom and crew, including Tej (Ludacris) and the cocky yet cowardly Roman (Tyrese Gibson) are out for their own revenge while top secret Black Ops-type leader Kurt Russell offers to help IF Dom and the “Furious” folks can help him hunt down terrorist Jakande (Djimon Hounsou). Seems Jakande has kidnapped famous hacker Megan Ramsey (Nathalie Emmanuel) to get his hands on the “God’s Eye”, a device which can easily track down anybody on the planet in record time. Deal goes: if Dom and crew can “get” Jakande, Dom can use this device to find his enemy Deckard Shaw. What results is a world-wide chase that travels from winding Azerbaijan mountain roads to the amazing skyscrapers in Dubai and back to L.A. Action includes cars parachuting out of planes and jumping from skyscraper to skyscraper and some intense hand-to-hand combat. Of course, our guys are triumphant and they say goodbye to one of their own; the character of Brian O’Connor and the man who played him, the late Paul Walker. 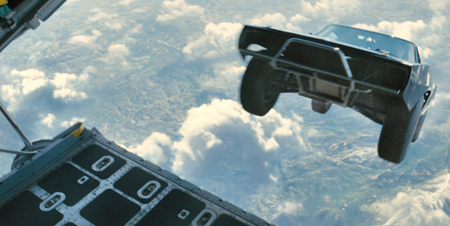 Furious 7, as it is called on screen, might be the best of the bunch! 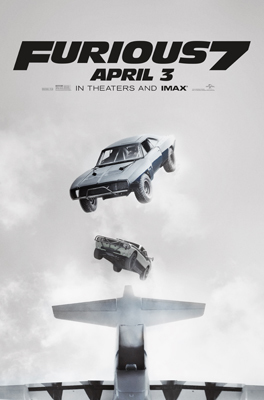 Stunts are amazing and fun to watch but most are physically impossible making the film more like a superhero actioner than the usual fast car competition. Various scenes depict cast members falling from incredible heights like cartoon characters and ending up with a few scratches and a bandaid but do we care? Nope. We aren’t watching these films for the reality quotient. The F&F gang gets to dress up and attend a big party that rivals any in the Mission Impossible or 007 films. This section of the movie I’d label “Fast and Furious meets Ocean’s 11” for the posh crime caper similarity. 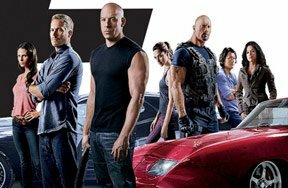 Although a little overly long, this new “Furious” is also packed with humor, much of it coming from the fun-bickering Ludacris and Tyrese Gibson characters and has more heart than usually evident in F&F movies. “Family” really means something this time around especially with a worthy and tear-jerking yet joyful tribute to the late actor Paul Walker who died in a real car crash before the film was finished. I had the privilege of interviewing the actor in person throughout his career and this tribute had me breaking out the Kleenex. Special Effects wizards, who created the marvels in the “Lord of the Rings” movies, worked with Paul’s brothers who stood in for him as body doubles while the effects guys used face-mapping on computer to reconstruct a pretty darn good duplicate of Paul for scenes still unfinished. It is hard to tell when Walker isn’t really there. 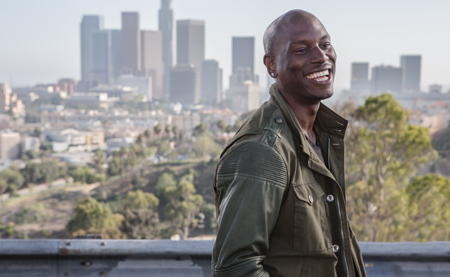 Tyrese, featuring Ludacris, performs the touching song “My Best Friend” on soundtrack during the tribute scenes. The film leaves the door open for more of the F&F movies but not sure they can top the “over-the-top” action stunts in this one. For a great combo of visual thrills, humor, true heart and a really entertaining evening at the cinema, we go five stars. 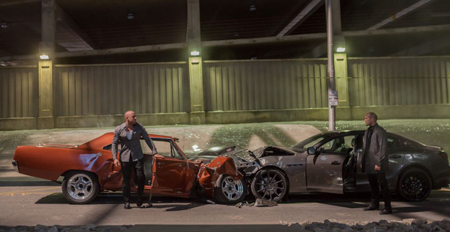 Furious 7 is in theaters now! 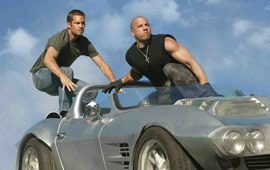 Which Fast & the Furious Movie is your fave?